We are all over the place this week getting ready for a big announcement this weekend so please excuse the lack of posts! It's taken me awhile to make a stuffed pepper that I really love. I've learned over time that red or yellow peppers are more my taste since they have a milder flavor than green peppers. I also now know that I need to season the stuffing more than I think I should. This time making them, I tried two new things that I definitely will be doing again. 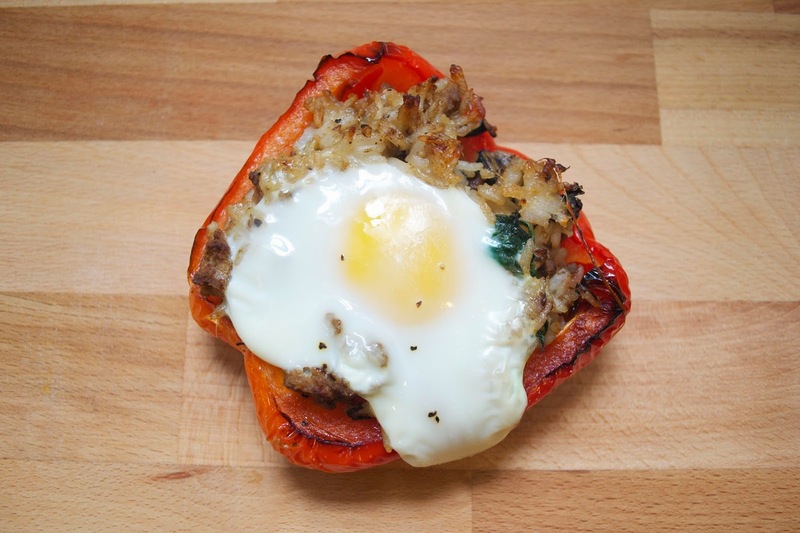 The first is that I roasted the peppers before I stuffed them and the second is that I cracked an egg on top. I've always had trouble cooking the pepper enough after stuffing and I really don't like it when my pepper isn't cooked. Roasting the peppers first made a world of difference. The egg bumped up this dish from side to main dish for me although Nate would probably call this a "Cassandra sized meal" so it isn't necessarily a main dish for everyone. I love topping rice with eggs and if you cook them just right, the yolk acts almost like a sauce and it's just awesome. If you haven't tried eggs with rice, nows the time! 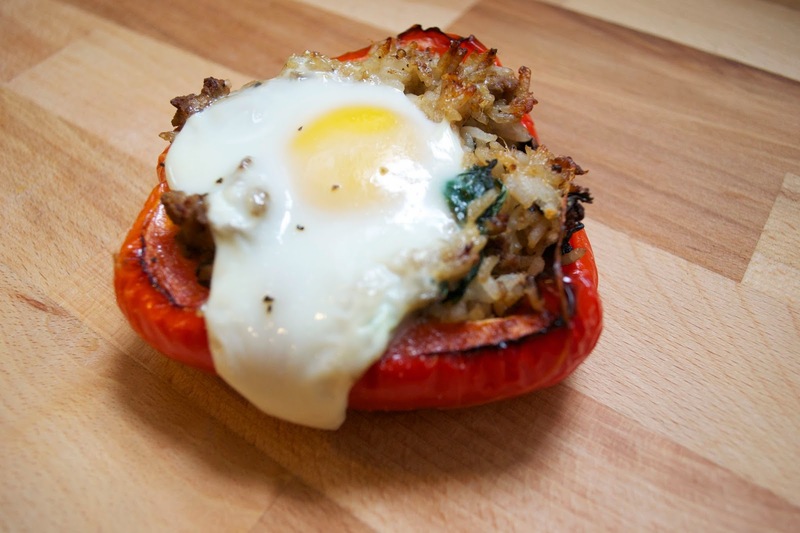 What's great about stuffed peppers is that you can really stuff them with whatever you want or have on hand so it's a great dish to be able to just throw together. This version is on the hearty side but you could easily lighten it up by leaving out the meat, or leaving out the rice and making it a carb free dish. I use a rice cooker to cook my rice while I make everything else, but if you don't have one, prep the rice before starting the peppers. I also make a lot more rice and save it for meals during the rest of the week. Preheat the oven to 425˚ F. Massage the bell pepper halves with olive oil and sprinkle with salt. Roast them in the oven for 5-10 min until tender. Let cool. While the peppers are roasting, heat 1 tbsp of olive oil in a skillet over medium-high heat and saute the garlic, onion and spicy pepper until fragrant, 2-3 minutes. Add the turkey and cook until almost cooked, stirring frequently. Add the mushrooms, onion powder and garlic salt and cook until the turkey is completely done. Reduce the heat and add the spinach. Saute until the spinach becomes limp (this does not take long) and then remove from heat. Add the soy sauce and worcestershire sauce to the turkey mixture and then add in the rice. Stir until everything is combined and then add the cheese and stir. Fill the pepper halves with the turkey and rice filling. Lay flat on a greased cookie sheet and use your thumb to make a good size indent in the center of the filling. Carefully crack an egg into each indent. Sprinkle the top of the egg with a little salt and place the cookie sheet in the oven. Cook 10-15 minutes until the eggs don't jiggle when you move the cookie sheet. Serve hot.